Meteor House » The Abnormalities of Stringent Strange – Cover Reveal! The Abnormalities of Stringent Strange – Cover Reveal! At long last we bring you the seemingly normal cover for one of the strangest books you may ever read, The Abnormalities of Stringent Strange by Rhys Hughes! We say seemingly normal because this is really a bit of a tease since you can only see the front cover. It’s when you flip the book over that you’ll be taken aback as your brain tries to process what it’s seeing. This cover, by the wonderfully talented Keith Howell, is a perfect parallel of the book itself. 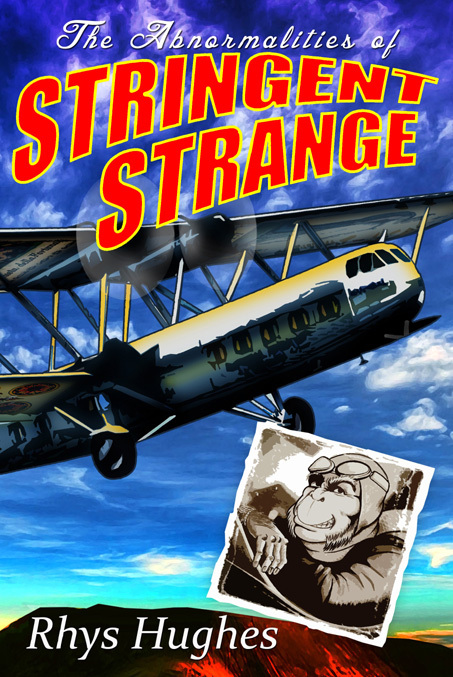 The Abnormalities of Stringent Strange begins like a slightly-off aviation pulp of the 1930s, then turns into a science fiction novel, then turns humorously surrealistic, and then, really and then, it just gets plain weird. Speaking of fearless readers, don’t forget that in addition to buying this wonderfully humorous surrealistic adventure, you can also purchase a deleted scene from the book that will be written just for you! This scene will show you fighting to the death in the gladiatorial arena against the author of your choice. Hmmm, that last sentence might be a little misleading, let’s try again. This scene will show you being killed in the gladiatorial arena by the author of your choice. (The part about you being killed is a small detail, but should probably be mentioned.) Here is a sample of the carnage that awaits. But know that your death will not be in vain, it will actually do some good. For every deleted scene Rhys Hughes writes, $4 will be donated to the charity of his choice, Animal Aid. And just to continue the weirdness, we should also mention that if you preorder, your copy of this SIGNED LIMITED EDITION soon, your name will appear in the story as a spectator. Ok, maybe that’s not all that weird. Awesome perhaps, but maybe not weird. Comments Off on The Abnormalities of Stringent Strange – Cover Reveal!